Recently a new Louis Vuitton bag joined savvy sister’s bag closet. This double long handle satchel, according to her, is a great bag for mommies who need to bring along with her own goodies, snack, diaper, water, and a little outer wear for tots. It’s light weight and durable. The retail price is great as well, only $675 which is a value bag for a Louis Vuitton or any designer bag actually. I can see this bag as a classic which a gal can use for seasons, just like a Prada bowling bag except with long straps for a gal's shoulder when she needs to multi-task. Is this savvy or too plain for you lovely savvy gals? I much prefer bags that don't have the brand's logo on it, or if there is only one small logo or something. But $675 is quite cheap for a designer bag! It's a good classic, but I also am not too keen on bags with logo's and I couldn't afford it even if I wanted to. The conversion of South African rands to dollars makes it even more expensive for us. Hi savvy-I think you've picked out a totally classic, timelessly stylish bag-well spotted! Hi from Paris stylish girl ! To be honest I'm not a fan of LV bags because of the logo for all over. And despite being an "affordable" designer bag is too expensive for me. I love how classic it is, though I usually like slouchy bags alot too! I used to be in love with those, but I'm not really into the monogram bags anymore..but if someone gave me one, I'd definitely use it! very cool! it goes with just about everything! 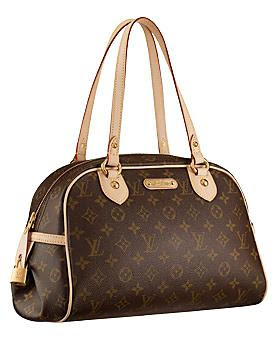 LV Monogram bags with plain lines are classic which will go with almost anything. Although I am not a big logo person nowadays, I will still buy LV casual bags once in a while. It's a great classic shape. I don't like logos all over a bag, which is why I wouldn't buy it, but I would consider it if it was logo free. Of course, that would defeat the purpose. It's very very nice. I see LV as being much more popular with the younger set(teens and 20's), but as said above "If someone gave me one, I'd surely use it! ".